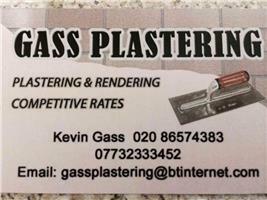 Gass Plastering & Rendering - Painter/Decorator, Plasterer based in South Croydon, Greater London. My name is Kevin Gass, I have been plastering and rendering for the last 25 years. I take pride in all the jobs I undertake and personally do all the work myself. Once I start a job I stay on until completion and do not start any other projects. This way I can give my clients the attention and personal service they deserve and expert from the tradesman they employ. I specialise in all forms of plaster and rendering works and take great pride in my work. I also have a few great tradesmen who work with me on certain jobs that require other services such as decorating, tiling and general building works. I cover the south east of London and Surrey.